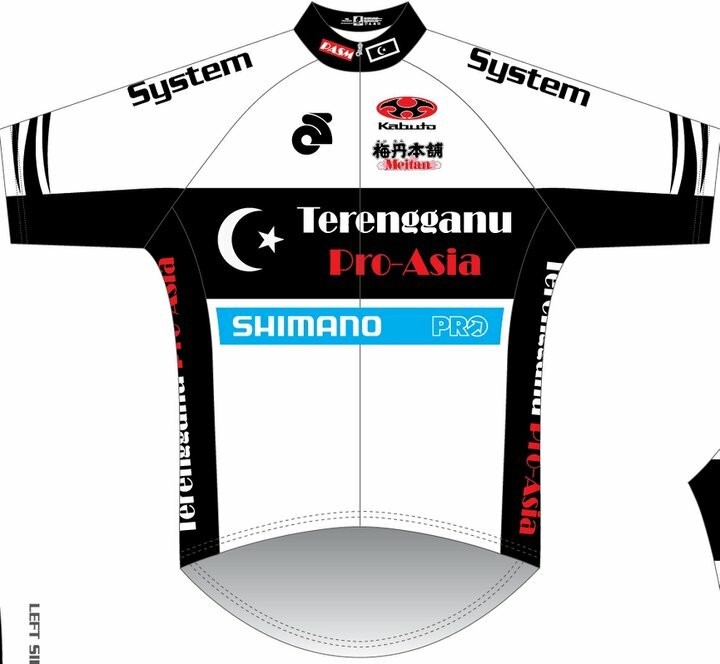 LTDL 23 Jan. : Terengganu Pro-Asia Cycling team (TSG) starts its 1st day of racing in beautiful island of Langkawi. After several years of absence from the island, the Tour de Langkawi finally made back to its origin. This year TDL HC category race has expended to 10 days covering close to 1400 km including 2 big mountain stages Cameron Highlands and Genting Highlands. There will plenty opportunities for both climbers and sprinters to shine, as well as breakaway specialists. Team TSG riders included Japanese captain Shinichi Fukushima, two very fast Malaysian sprinters Anuar Manan and Harrif Salleh, Thai climber Phuchong Sai-Udomsin plus two strong domestiques Saufi Mat Senan and Shahrul Mat Amin of Malaysia. Stage 1 is 94.3km loop around the Langkawi island, since it is the dry season, the weather is extremely hot and windy. The 1st stage has three intermediate sprints and three Cat 4 climbs. The race started sharp at 10 am, peloton’s pace was as hot as the weather, covering 50km in just 1st hour. The 1st intermediated sprint came just 20km into the race, Phuchong set up Anuar perfectly to take the 1st sprint, 5 points plus 3 sec bonus. Sprint 2 came 30km later, TSG strike again with Harrif tolling Anuar to the line, Anuar took 1st and Harrif narrowly missed the 2nd on a photo finish. Just after the 2nd sprint, a group of 10 riders escaped with 30 second gap including Phuchong heading into the 2nd KOM. He was in good position and took 2nd on the climb and 2 KOM points. The escape was reeled back by the peloton with 35km to the finish. A group of 20 riders counter attacked and escaped, they managed to build up a 30 seconds gap. With no TSG riders presented in the group, 3 TSG riders including Shinichi got to the front of the peloton to lift the pace. The gap never grew more than 35 seconds and with 10km to the finish, the peloton was back to one bunch and preparing for the sprint finish. In the last 3km, the peloton was a bit chaotic as every team trying to send their sprinters up front. Harrif could not get into a good position to lead out Anuar, so Anuar been the more experienced sprinter and great bike handler decided to reverse the role and lead out Harrif instead. Harrif took the 3rd placing just lost to Park Sungbaek of Korea. Andre Guardini from Farnese Vini team cross the line 1st taking the yellow jersey. TSG finished its 1st day of racing top in overall team standing. Anuar gained sufficient time bonus from the 1st two intermediate sprints to place 3rd in the GC just 4 second behind the yellow jersey and same time as Park. Harrif in 4th overall just 1 second behind Park and Anuar. With the 2 intermediate sprint points and final 3rd placing Harrif equals Andre on points and will be wearing the points jersey since Andre will be the yellow jersey wearer. . 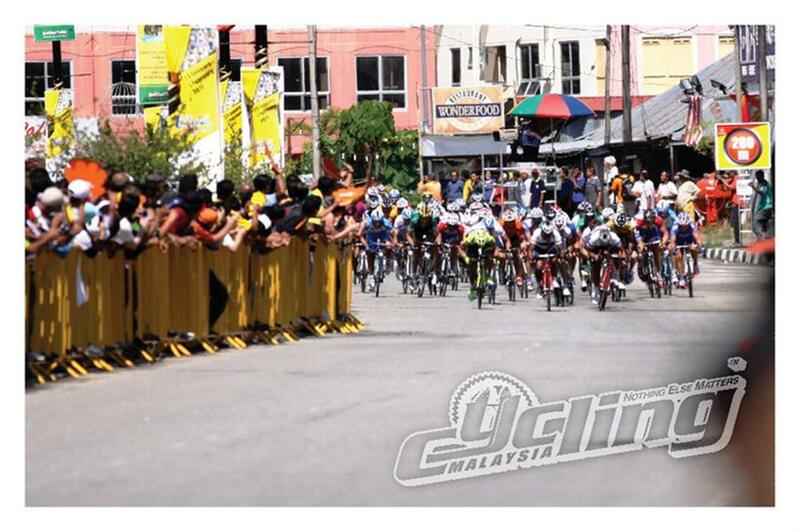 Tomorrow will be another good opportunity for the sprinters once again with 145km stage from Kangar to Butterworth. The course will be flat but once again hot and windy as riders will race down the west coast of Malaysia toward Pinang. With both Anuar and Harrif high in the GC and points classification, TSG will be on the offensive tomorrow. Mohd Harrif Salleh - waiting for the prize presentation at Le Tour de Langkawi Stage 1.